World class bobble head features heavyweight, polyresin construction and comes in a colorful, fact-filled collector's box. Stands 8" tall. Abraham Lincoln served as the 16th President of the United States from March 1861 until his assassination in April 1865. He successfully led his country through its greatest internal crisis, the American Civil War, preserving the Union and ending slavery. Before his election in 1860 as the first Republican president, Lincoln had been a country lawyer, an Illinois state legislator, a member of the United States House of Representatives, and twice an unsuccessful candidate for election to the U.S. Senate. As President, he introduced measures that resulted in the abolition of slavery, issuing his Emancipation Proclamation in 1863 and promoting the passage of the Thirteenth Amendment to the Constitution. NEW for 2018! This is our 2nd version of Abraham Lincoln! 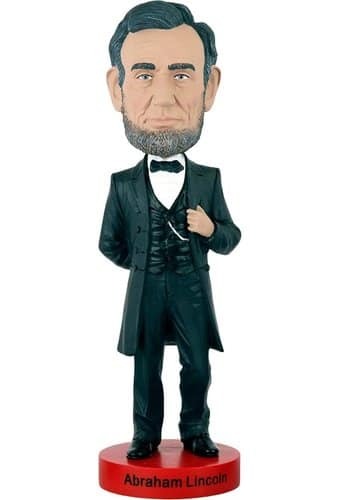 This intricately detailed bobble head portrays a lifelike image of Abraham Lincoln. Our highly collectible bobblehead stands at over 8” tall and is made from high quality heavyweight polyresin. Comes complete with a colorful, printed collector’s box and molded Styrofoam inner protection to keep your bobblehead safe and protected. Each Royal Bobble comes with it's own unique serial number located on the bottom of the base to indicate Authenticity.